John lives with his spouse, Valeri Reynolds, in Richmond along with their two dogs – Crinky a Fawn Pug, and Jemma a Rat Terrier mix, as well as John Henry their Toy Shetland Pony, two goats, and Sully a Draft Cross horse. Also, there is Henry, the tailless cat. Valeri & Dr. Reynolds have three grown children who are off in the world getting educated and working. He went to Colgate University for BS and then to the New York State College of Veterinary Medicine at Cornell University. John also participated in a yearlong internship at the Oradell Animal Hospital and referral center in NJ. Dr. Reynolds has been active in the Central Berkshire community since moving to Pittsfield in 1996. He has been a member of the Rotary Club of Pittsfield, holding the offices of Treasure, Vice President and President, as well as the President of the Pittsfield Rotary Foundation. He has been a member of the Animal Control Commission of Pittsfield since 1998, holding the role of Chair since 2001. The Commission is a subcommittee of the Pittsfield City Council and also serves as the Hearing Board for animal control violations. 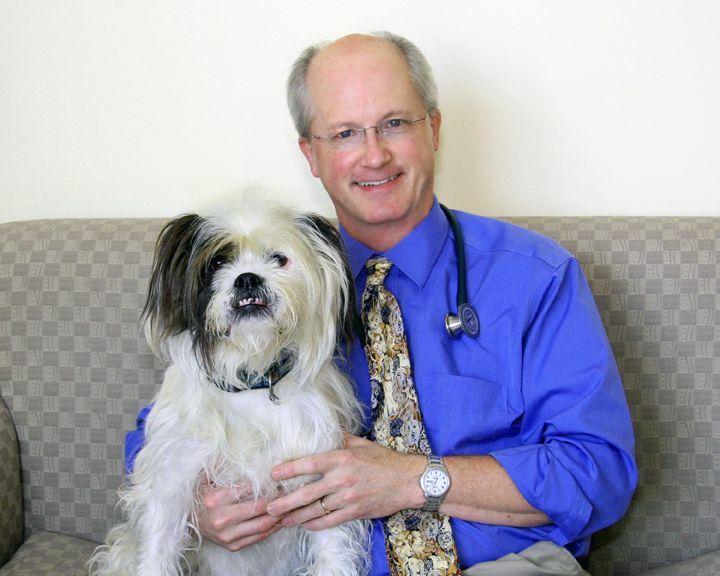 Dr. Reynolds has led the staff at PVH to work closely with the Berkshire Humane Society since 1996. In 2012, he was asked to be on the Board of Directors for BHS and in 2016 was awarded Volunteer of the Year by the staff members. 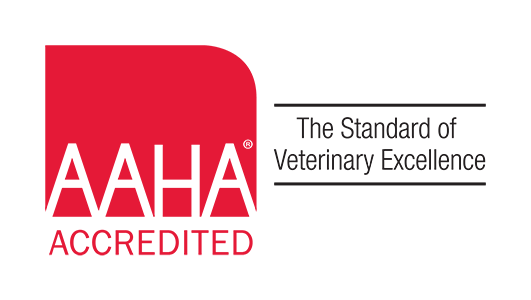 ​​​​​​​Starting in 2004, he has been a member of Veterinary Study Groups Inc., a Veterinary Management group for hospital owners that provides continuous education, support and camaraderie. Additionally he has become trained in the use of both rigid and flexible endoscopy and has equipped the operating room with the necessary equipment to offer these services. Even after almost thirty years as a veterinarian, Dr. Reynolds has found that creating an outstanding workplace for his team where outstanding veterinary services are offered to the patients is just as exciting as removing a bouncy ball from a dogs stomach with an endoscope. Besides owning Pittsfield Vet, John is also a veterinarian with a special interest in surgery, endoscopy and dental surgery. He is a leader of the management Lead Team of the veterinary hospital, and also head of maintenance and back up snow shoveler. ​​​​​​​Outside of work John relishes running to train for 5k to ½ marathon races, paddling kayaks, canoes and paddleboards, moving rocks – the larger the better, caring for the barn critters and playing in a good game of Mahjongg with Valeri and friends. He and Valeri love to cook and enjoy trying new cuisines. Lasagna with homemade spinach pasta and Bolognese sauce is a favorite! 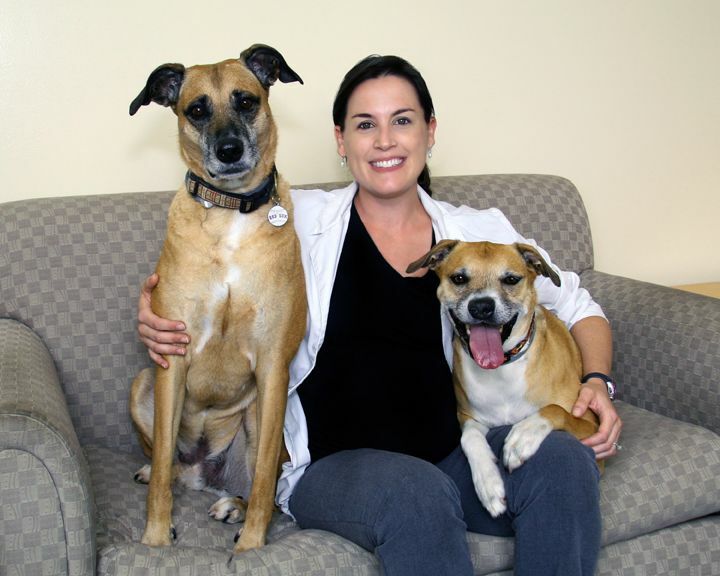 Dr. Looney, formerly Michelle (Missy) Joseph, grew up just a couple of miles away from Pittsfield Veterinary Hospital. As a matter of fact, Dr. Perry, the original owner of Pittsfield Vet actually took care of her family pets! After graduating from New Lebanon High School, Dr. Looney received her undergraduate degrees from the College of Saint Rose in Albany, NY. From there she moved to Knoxville, Tennessee where she immensely enjoyed the warm weather and hiking in the Great Smoky Mountains while receiving her education at The University of Tennessee, College of Veterinary Medicine. 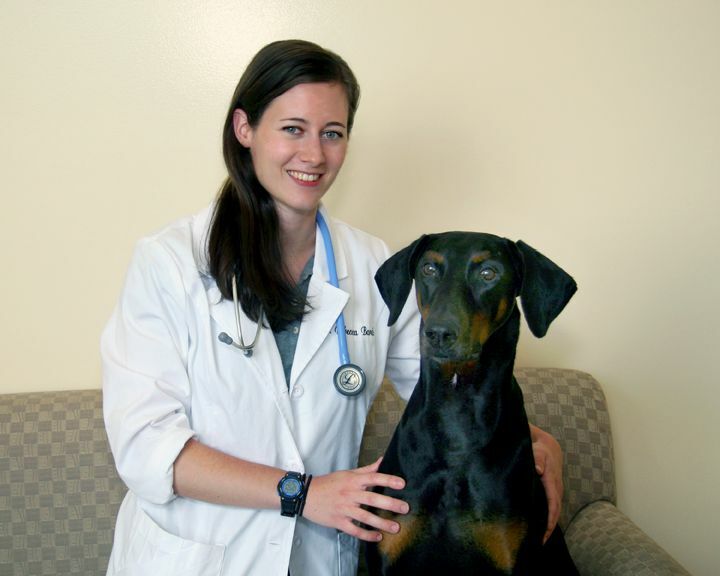 After veterinary school, she completed an internship in small animal medicine and surgery at Oradell Animal Hospital in NJ, a busy emergency referral practice just outside of NYC. Dr. Looney initially settled north of Boston working in a rapidly growing emergency referral practice where she met her husband Jim and started a family. After ten years of practice in that area, in 2005, she moved back home to the berkshires. She and her husband have three beautiful children, and many pets, including Sasha the black labrador, Smudge the chihuahua/pekingese mix, Maggie the cat, Chubby and Sky the parakeets and Iggy and Fang the rats. Bridget ambitiously chased that dream and attended New Hampshire University where she obtained her B.S. in Pre Veterinary Medicine. 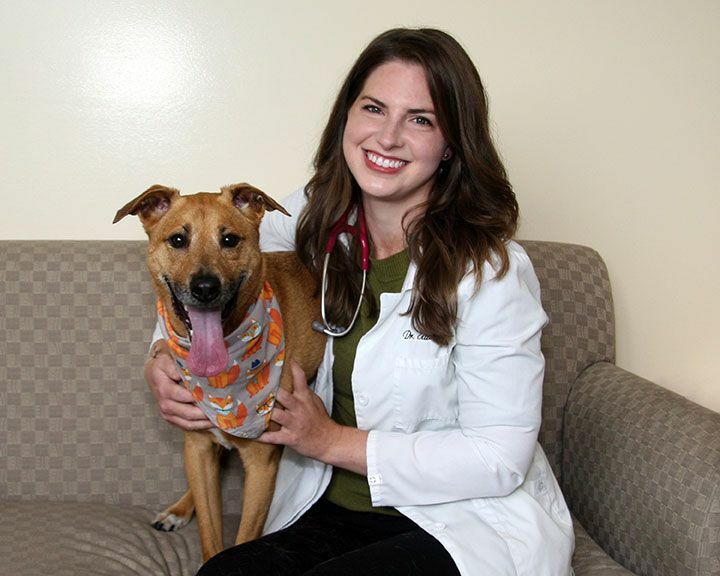 After graduation, she continued her academic career at Ross University School of Veterinary Medicine and completed her Clinical year at Cornell University School of Veterinary Medicine. Dr. Pope graduated in May of 2014 when she joined Pittsfield Veterinary Hospital as a full-time associate and moved to the Berkshires. During Undergraduate school, Bridget met her husband Spencer, who is also an avid animal lover and outdoor enthusiast. Together they love spending time outside. Some of their favorite activities include hiking, skiing, and horseback riding. They also spend a lot of time traveling with their two beautiful children, Alexander (a very active toddler) and Anika (their one year old), to see family. At home, you can find two wonderful dogs with unique personalities. There is a black mouth Cur named Indiana Jones and a boxer mix named Sammy, both of whom were brought home for the Caribbean. The Pope family also has an ancient English Lop rabbit who hops around the house and hangs out with the dogs. ​​​​Dr. Mady knew she wanted to be a veterinarian since she was 6 years old and is living her dream working at Pittsfield Vet. She graduated from University of Vermont with a pre vet degree. Upon graduation she copmpleted her Doctorate of Veterinary medicine from Iowa State University College of Veterinary Medicine. There, she was an active participant in the ISU Feral Cat Alliance and president of the Holistic club. Since graduating she has practiced in NJ, NY and Massachusetts. 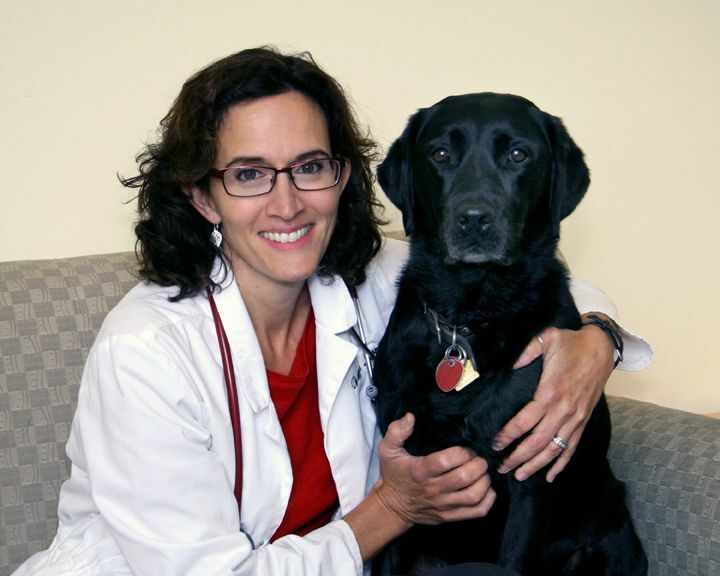 At Pittsfield Vet, Dr. Mady specializes in Chiropractic, Acupuncture and Holistic medicine. She also has interests in internal medicine, radiology and physical therapy. She completed the veterinary spinal manipulation course at the Healing Oasis in Wisconsin in addition to completing the basic and advanced acupuncture courses at the Chi Institute in Florida. She lives on a hobby farm in Columbia county NY. In her spare time she continues to ride horses, garden, and play volleyball on a local team. Dr. Mady is fluent in French. Dr. Kulik, a graduate of the Cummings School of Veterinary Medicine at Tufts University, joined the team at Pittsfield Veterinary Hospital in June 2016. 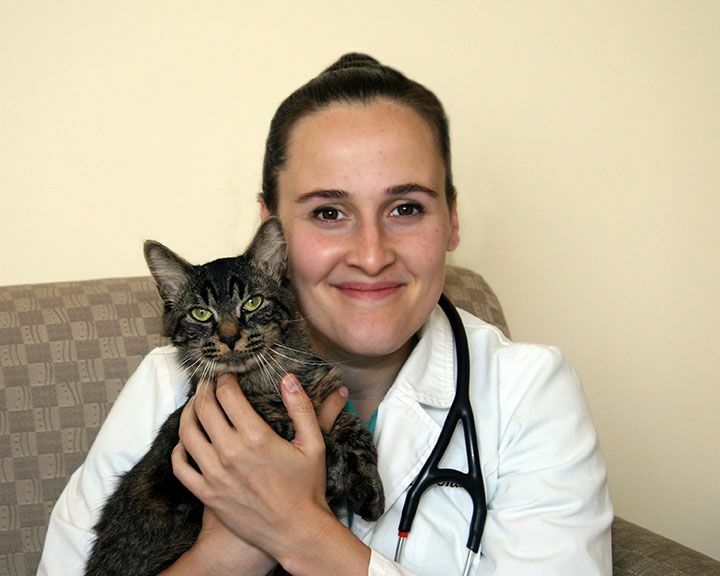 Prior to veterinary school, Dr. Kulik obtained a B.A. in Sociology from Tufts University and worked at a nonprofit organization in Washington, DC for several years. A volunteer position at an animal shelter is what inspired her to make a dramatic change in her career. Dr. Kulik loves being a general practitioner because the wide variety of patients and medical concerns makes every day unique! She enjoys working with clients to meet their individual needs and the needs of their animal companions.​​​ A native of Worthington, MA, Dr. Kulik has always loved Western Massachusetts and is thrilled to have settled here in the Berkshires. ​​​​​​​In her free time, Dr. Kulik enjoys sewing, kayaking, and observing wildlife. She and her partner Matt live in Washington, MA and have two pets: an orange tabby cat named Levon and a "dixie dog" named Tucker. Rebecca grew up in New Jersey with her parents, two older sisters and numerous pets. After graduating from high school, Rebecca worked at a small animal hospital that really helped develop her interest in veterinary medicine. She attended the University of Massachusetts Amherst for her undergraduate studies where she obtained her Bachelor’s degree in Pre-Veterinary Sciences. After finishing up her studies in Massachusetts she then moved to Minnesota and received her Doctorate of Veterinary Medicine from the University of Minnesota. Rebecca continues to enjoy her position with us at Pittsfield Veterinary Hospital and is thrilled to be back on the east coast since finishing her doctorate. She has a special interest in preventative medicine and loves the diversity of being a general practitioner. When she has some downtime, Rebecca loves spending time with her cat Archer & Ivy, reading a good book with a nice glass of wine, or participating in a 5k/10k. She has been enjoying everything the Berkshires has to offer since moving back over a year ago. In her spare time during the winter months you will find Rebecca at any of the nearby mountains enjoying some downhill skiing.